Colorado Springs nestles in the foothills of the Rocky Mountains in Colorado. Not far away, Denver 60 odd miles to the north, shares a similar topography. As such both cities are subject to mountain weather in the form of occassional blizzards or snow storms and whose temperatures often crash below zero. In the fahrenheit scale, 32 degrees is freezing so zero and below is incredibly cold. Both Denver and the Springs also boast of being a mile or more above sea level and as such they both enjoy winds which create a chill factor in which only Polar Bears could raise a smile. As we sat in Colorado Springs waiting for our adventures to begin, the winter was closing in. 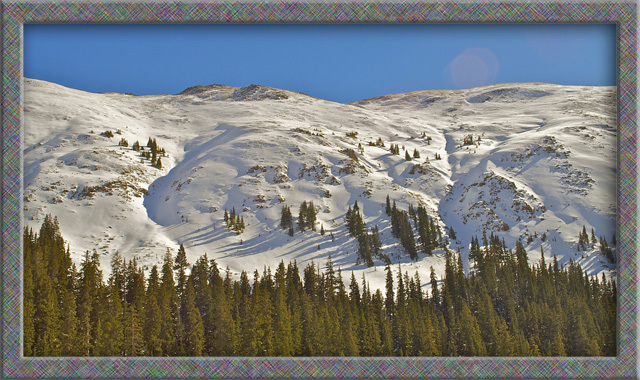 We wanted to cross the Rockies along Interstate 70 but that Highway reaches altitudes of more than 9,000 feet as it skirts close by the well known ski resorts of Vale and Breckenridge. 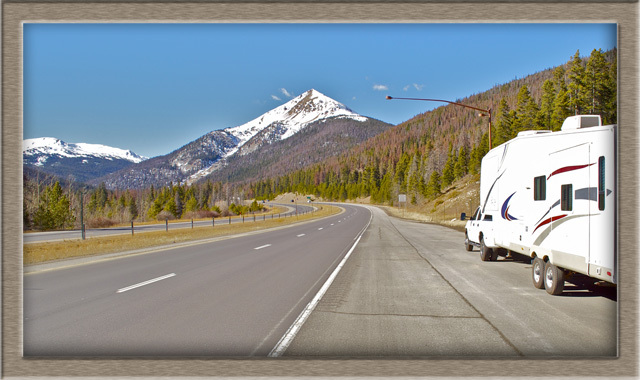 In those areas the I70 passes through freezing tunnels, enjoying 1 in 6 ascents and long descents which sometimes strikes fear into the hearts of seasoned truckies. These roads are the ‘arteries’ of the country’s transport system and ‘the show must go on’ …well, at least until the state authorities close the mountain roads due to ice and snow. For the truckies at least, it is illegal not to carry chains for their tyres on certain roads….as I said “The show must go on”. On the other side of the Rockies was a ‘carrot’ that was encouraging us to make this mildly foolhardy journey. The small tourist town of Moab nestles in a quiet valley between Arches National Park, Canyonlands National Park and the La Sal mountain range which also has a snow line and snow capped peaks in winter. Moab itself is nothing special beyond most tourism based towns but its close proximity to several incredibly beautiful national and state parks is what draws thousands of visitors each year to Moab. And so it was that we found our weather break and set off from Colorado Springs heading North on Interstate 25 towards Denver. Our fifth wheel was now properly set up, equipped and stocked ready for our life on the road. In preparation for our journey we consulted Mapquest.com , put in our start and finish town names and the program gave us our turn by turn driving instructions (ie. Take the US-191 S exit, EXIT 182, toward CRESCENT JCT/MOAB.) for the whole 420 mile journey along with their timing calculation of 6hrs and 31 minutes (If we maintain full legal speed limit!!!). If you’re familiar with Mapquest, there is a new version available via a clickable ‘Check out the new Mapquest’ at the top of the page. If you prefer the old mapquest you can go back via a button at the page bottom (Go to Classic Mapquest). Our timidity with our new rig, with the icy roads and with so many steep inclines and declines for this journey, led us to seek a halfway stop. We chose the small town of Rifle as there was a Walmart Superstore close to the highway at this town. Many of the Walmart Stores allow overnight parking of RVs in their back parking blocks and this would cost nothing in park fees. The photo above was taken at the westbound exit of a very long tunnel and immediately ahead of us was a six mile long fairly steep decline with ice and snow everywhere. Even the truckies were pulling over before descending. We were at around 9000 ft in elevation so I deduced that the bottom of this next ‘hill’ would be less icy and we should push on. Within about one mile the roads were clear of snow and the going became easier. However the Rockies is a big place and there were many more hillclimbs and descents in front of us. I mentioned in ‘The Beast’ page that the Silverado has a fantastic Allison gearbox and I was slowly learning to use it the way it was designed to be used. My initial ‘white knuckles’ and dry mouth subsided slowly and I came to really appreciate the truck. 48 hours later, after a freezing cold night in Rifle, we finally pulled in to our RV park under the mountains around Moab in Utah. 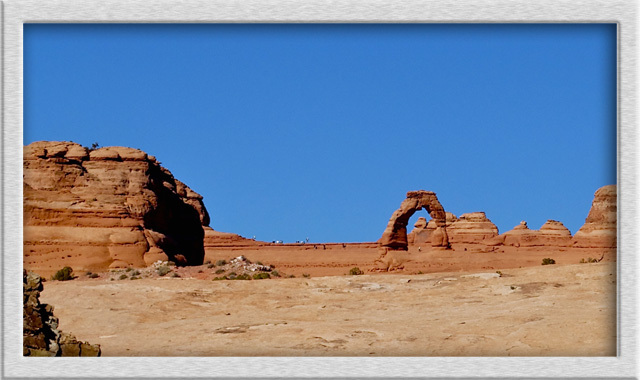 We chose the Okay RV Park which is on the southern outskirts of Moab and more precisely, on Spanish Valley Drive. When we booked in, they asked us if we belonged to Passport America. The blank look from us quickly conveyed to the receptionist that we didn’t. They went on to explain that as Passport America members, we would be entitled to 50% discount off many RV park rates….theirs included. The park quickly signed us up for a $44.00 joining fee which we subsequently saved by booking a three night stay at their park. As we ended up staying another six nights, also at the 50% reduced rate, we were well in front financially. On signing up we were given the Passport America camping directory which lists more than 1700 RV sites all over America, Canada and Mexico. Moab lived up to its reputation and proved to be a really exciting place to stay. We visited several national parks which were amazing to visit and, as a photographer, gave me endless views and scenery at which to point my camera. 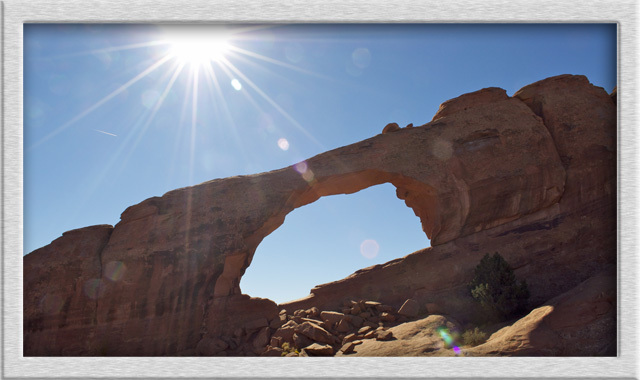 Arches National Park has more than 2000 sandstone arches within its 119 square miles. Originally designated as a National Monument on April 12, 1929. It was redesignated as a National Park on November 12, 1971. 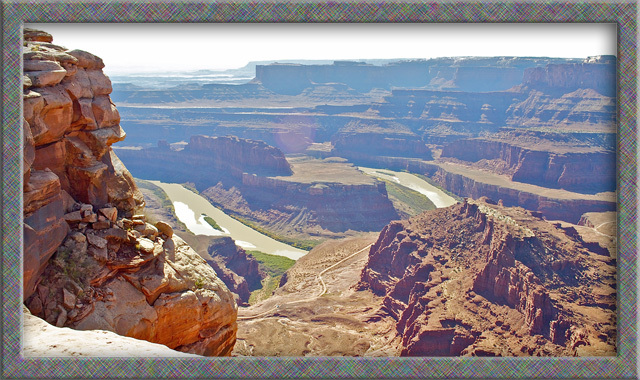 Canyonlands National Park much larger at more than 520 square miles and enjoyed more than 400,000 visitors in 2008. The Colorado River, as well as the Green River, meander slowly through its many canyons creating wild barren landscapes of incredible beauty. Our 10 day visit was too short, but the whole area of the Colorado Plateau, which rises above the states of Colorado, Utah, Arizona and new Mexico, is a must return visit. Dead Horse Point State Park is much smaller but has more incredible beauty akin to this whole area. In the photo below, The Colorado River is nearly 2000ft below. Not far from this photo standpoint is a really nice State park information centre and bookable campground including RV sites. After saying our farewells at Moab we drove onto 191 for 30 odd miles and rejoined the Interstate 70 for our continuing trip west. We knew we were in for more high altitude driving and were not surprised when a snow storm slowed our progress to the point we decided to stop in a small town called Beaver. The park we chose was basic but had a really nice old world Mexican restaurant on site called Maria’s Cocina. .It is without a doubt the best authentic Mexican food restaurant in the area. 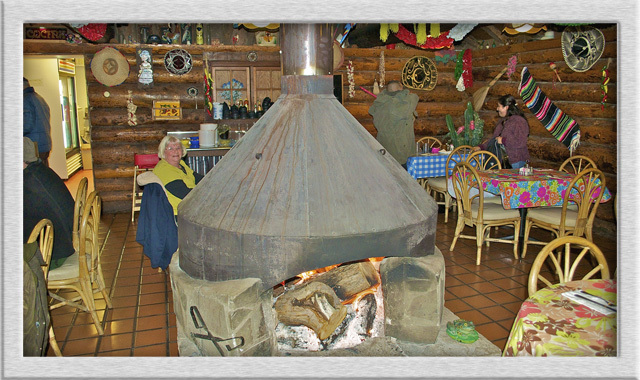 The Restaurant is a log cabin style building with a large central fire place that’s always burning during the cooler months. Really friendly staff at the park and at Maria’s made our overnight stop really pleasurable. Are you ready for some music? I just worked out how to add a reply to comments (my apologies). Firstly, thanks for your kind words and I’m glad you enjoyed the website. We certainly are enjoying writing and photographing our travels. 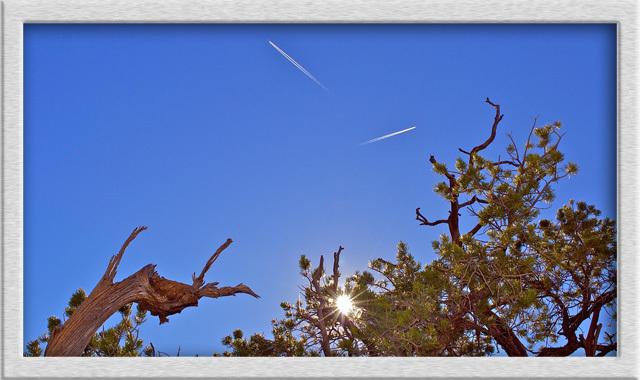 Our latest page is ‘New Mexico’ and features a short slide show on the White Sands National Monument (desert) which we really enjoyed. We’re getting ready to release a 5 minute music/ slide / movie of our time so far. Just had a good look at your vehicle and home! Massive isn’t it? Looks great. Loved that gift shop called Bella Terrazza in Fort Stockton Texas. All the animals are lovely to see. You must be having such a great time. Keep well and keep going! Glad you’re enjoying the website, We are always updating so come back anytime – our latest update is the page ‘New Mexico’ which also has a slide show at the bottom of the text. 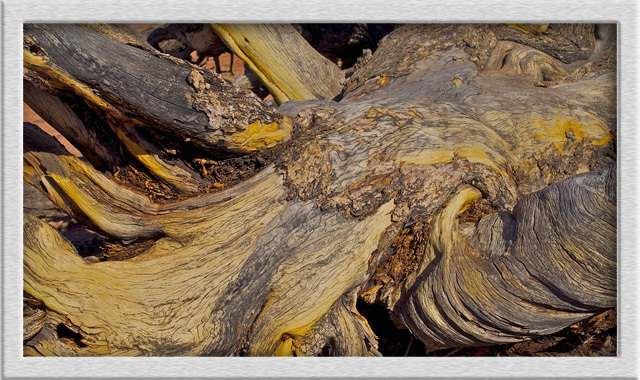 The slide show features pictures from the White Sands Desert. It’s has been a while that we lost track of each other. I lost your contacts but just this morning I was sitting with Sala and thinking about both of you. I decided to search your name through google and to our pleasant surprise saw your website. We really enjoyed reading and going through the pics. Tom the pictures are great and you look great with your truck and it’s also great to hear that you are both well and enjoying every bit of the adventure in discovering America. It’s so amazing to see God’s miltifaceted wisdom, handiwork and craftsmanship. Apart from this may God continue to take care of you both. Heather you are also looking great and I believe you are writing a book about America.